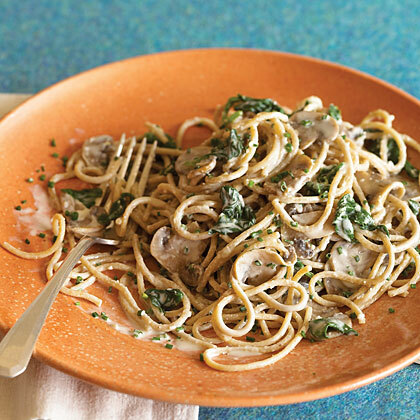 This healthy spinach mushroom dish is a popular choice for vegetarians and meat-lovers alike. Hearty whole-wheat pasta is quite filling, and a full pound of sliced mushrooms makes this dinner truly satisfying. Boil 2 qts. water in a large pot and cook pasta according to package directions. Drain and transfer to a large serving bowl. Heat olive oil in a large frying pan, add garlic and mushrooms, and cook until softened, about 5 minutes. Add cream cheese and milk and heat until boiling, stirring often. Add spinach and cook until wilted, about 3 minutes. Season to taste with salt and pepper, then pour over pasta. Sprinkle with chives and serve with parmesan on the side.